Fever. Chills. Cold sweats. Nausea. Ebola? No, these are the classic signs of a market-induced malaise caused by rampant fear and worry over the wrong things. The market, which seemed to be itching for a downturn, scared itself into one over a rash of unconnected symptoms. From Ebola fever (the media-induced variety), to concerns over slowing growth in Europe, and even some handwringing over the Fed, slushed together to create a very challenging and unsettling few days in the markets. Volatility, an oscillating indicator, has swung back from the lows of 2013 to levels not seen since 2011 when the debt crisis was front and center. At Astor, we systemically calculate the underlining strength (or weakness) in the economy and adjust exposure to risk assets (stocks) accordingly. As we look out over the landscape of economic indicators we see no reason to panic. Our proprietary measuring techniques continue to show the same slow and steady growth we have experienced the past few years. If anything, we see far more impetus to increase equity exposure. But what do we make of all these fears? To be sure the market has been scary the past several days and volatility has increased substantially. Let me try and shed some light on the facts. First, to draw a parallel between the markets and the Ebola scare, one person from Liberia has died in Texas, and two healthcare workers who cared for him have tested positive (as of this writing, one is in good condition and the other is stable). Although Texas state health officials have estimated Ebola exposure could involve seventy-five people, this is hardly an epidemic. It isn’t even a health hazard! To put this in perspective and if you want to worry about a contagion, think about influenza! Influenza kills about 50,000 people a year, according to the Centers for Disease Control. So get a flu shot, and stop watching the Ebola anxiety-inducing news segments. Or think of it this way: You have a statistically greater chance of winning the lottery than you do of contracting Ebola in the U.S. While the healthcare system needs to be responsive and have all the proper precautions in place, the rest of us would do well to “keep calm and carry on,” as the saying goes. When people aren’t worrying about one thing then they worry about another; and in the absence of another they worry about the stock market. Specifically, when will the stimulus end and what will happen to stocks when it does? Well, the Fed has been very vocal about its plans to ease the stimulus when the economy is strong enough to handle it. As the FOMC minutes from mid-September stated, there have been discussions about “ways to normalize the stance of monetary policies and the Federal Reserve’s securities holdings,” but that does “not imply that normalizing will begin soon.” Enough said for now. What about Europe? China? Japan? If growth slows there, what will happen here? History provides the answer. Recessions have rarely, if ever, been the result of a deteriorating economy abroad or an escalation of geopolitical events. It’s possible we could have lighter growth if Europe slows down, but it won’t be enough to put the U.S. economy into recession. We’ll just have a little less “up” in our upward momentum. So what’s causing all these jitters—the feverishness, sweats, cold chills? As I have said on many occasion, including a few paragraphs ago, volatility is an oscillating indicator, but stocks (over time) are positively sloped. Sure, it is a little riskier to be in stocks lately. However, the current economic fundamentals support owning stocks and taking that risk. If you look at the Leading Economic Index (LEI), released by the Conference Board, it has shown steady increases, indicating moderate growth in the economy (see Chart 1). 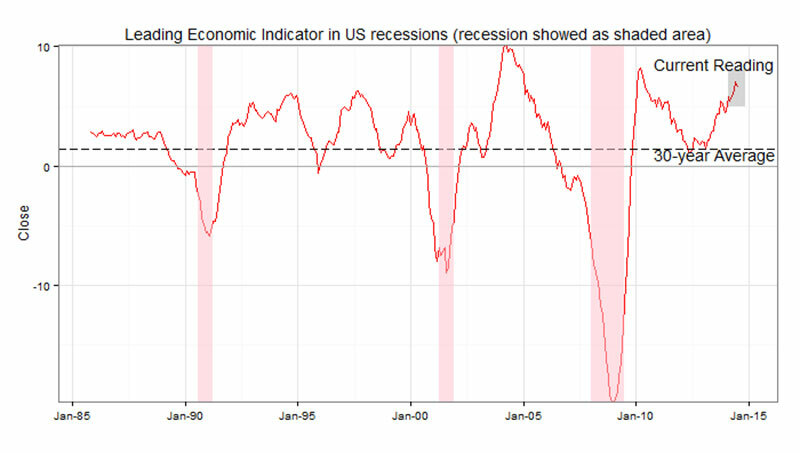 At Astor, we use a proprietary blend of economic indicators to gauge the strength or weakness of the economy. Current readings also indicate positive economic fundamentals. Thus, the trend of fundamentals is precisely where investors ought to be focusing their attention. 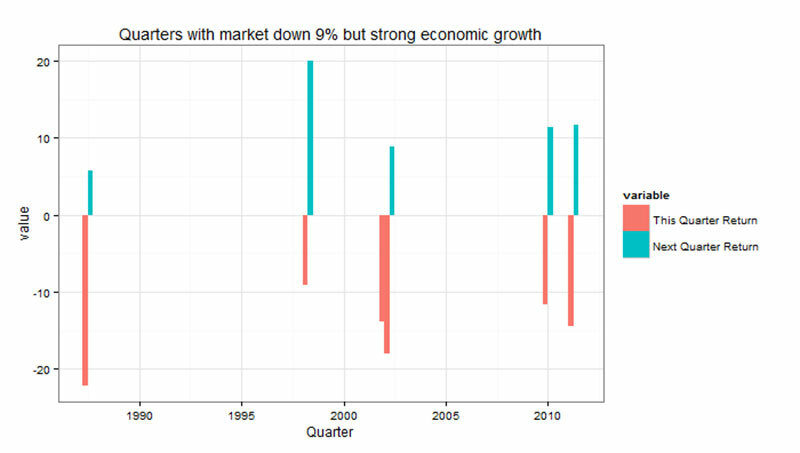 As the accompanying data show, over the last 30 years, exiting the stock market during any quarter in which equities were down 9 percent, while the economy was still growing above long term trends, would have been a bad idea. (See Chart 2 and 3). During those volatile moments, investors would have dodged a few bullets, but given the reduction in returns over a longer period of time, that would not have been an advantageous move. The only time it pays to be defensive because of a 9-plus percent market correction, is when the economic fundamentals are also declining. In fact, when economic fundamentals are positive and the markets are down 9-10 percent, history has shown these periods to be the best time to allocate to stocks. We feel confident that the current environment has the potential to produce this favorable scenario and thus have added exposure recently. All information contained herein is for informational purposes only. This is not a solicitation to offer investment advice in any state where it would be unlawful. There is no assurance that the programs will produce profitable returns or that any account will have results similar to that of a composite. Past performance is not a guarantee of future results. You may lose money. Factors impacting client returns include individual client risk tolerance, restrictions a client may place on the account, investment objectives, choice of broker dealers or custodians, as well as other factors. Any particular client’s account performance may differ from the program results due to, among other things, commission, timing of order entry, or the manner in which the trades are executed. The investment return and principal value of an investment will fluctuate and an investor’s equity, when liquidated, may be worth more or less than the original cost. Analysis and research are provided for informational purposes only, not for trading or investing purposes. Astor and its affiliates are not liable for the accuracy, usefulness or availability of any such information or liable for any trading or investing based on such information. Please refer to Astor’s Form ADV Part 2 for additional information and risks. S&P 500 Index: The S&P 500 Index is an unmanaged composite of 500 large capitalization companies. S&P 500 is a registered trademark of McGraw-Hill, Inc.
Conference Board Leading Economic Index: The Leading Economic Index represents a composite of ten different economic and market related components including stock prices, interest rate spreads, and manufacturing data. The Index is published on a monthly basis and is not investable.